"Those were the days"...when the CAT/IEA was an organization controlled by administrators. One "old CAT" reminisced that, as a "kitten", he was called into the Principal's office and told that teachers were supposed to join the CAT. The independent-minded teacher (a natural CAT trait) declined, much to the bewilderment and disappointment of the Principal. 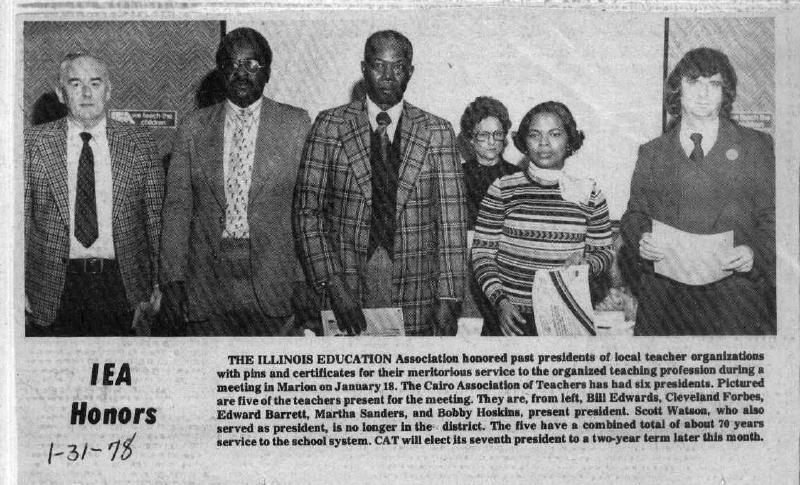 The teacher later discovered that without his knowledge, the Principal had paid the teacher's Association dues...so as not to look bad in the eyes of the Superintendent/BOE...gotta show 100%. Now, those were the "good ol' days" for sure! Postscript: Most of those pictured made a very strong transition to the teacher-controlled CAT/IEA...leading it into the "radical" era! Pictured below are the "successors" receiving their recognition. On the left is Linda Folsom, who was President during the 1978 strike. On the right is Jeff Wissinger who succeeded her. 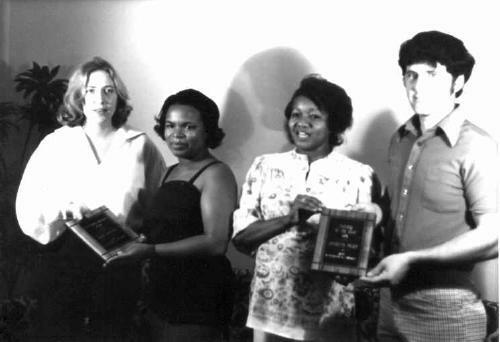 Making the presentations are Martha Sanders (2nd from the left), who was elected to succeed Jeff Wissinger, and Jennette Posey (2nd from the right), who was in the process of fighting her legal battle against the District for racial discrimination...a battle she later won. It is hoped that we can put together a chronological listing of all of the CAT Presidents - not even sure we have accounted for all of them as yet. Help would be greatly appreciated. If you have information that would assist us, please drop us an e-mail.